Twitter released a new feature called ‘Muted Tweets’, essentially it allows users to prevent tweets from people they follow from appearing. 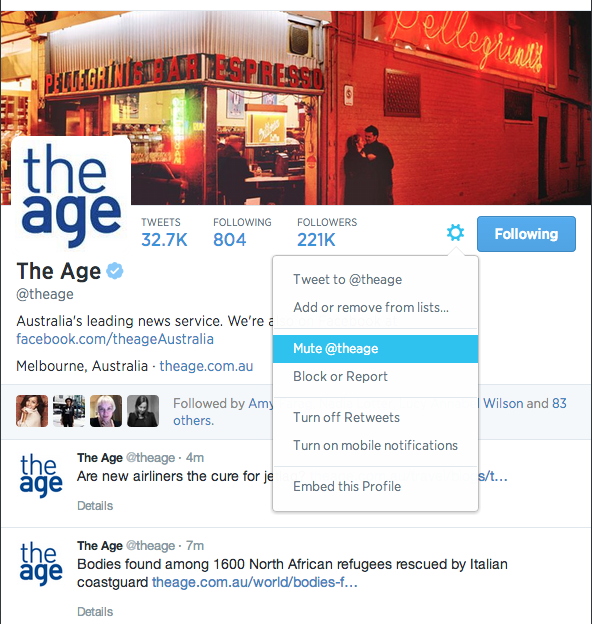 Sometimes it’s hard to unfollow people, so Twitter now allows you to ‘mute’ them. The user you mute will not be notified. We all love to be followed by a brand we love, so what if brands followed more Twitter users and then just ‘muted’ their tweets so they didn’t clog up their Twitter feed. I think this is a valid approach to growing your Twitter followers and building brand relationships. If you ‘mute’ a user they can still @reply, RT, @mention and favourite your tweets, they’ll never know you’re not listening to them. Would you employ this Twitter approach as a brand? For those of you that don’t know me, I’m a HUGE NBA fan so writing a story on this gives me a solid high. NBA teams are leaps and bounds ahead of any Australian sporting club when it comes to digital it’s not funny. If you’re interested in how digital plays a major role in sports I would suggest following some NBA teams or even the NBA itself. A bold and genius move has been set by the Sacramento Kings GM Pete D’Alessandro, he’s reached out to the NBA analytics community for data analysis about whether the Kings should trade the eighth pick in the draft and whom they should select if they keep their pick. Just so we’re clear, the NBA draft is a huge televised event and picks can either help a team win a championship or the wrong pick could see them suffer for many years to come. This years draft prospects happens to be rich full of great talent, so the Kings now want to know who would they pick and why? By crowdsourcing this it does a few things for the brand. For me, this is a brilliant way to use crowdsourcing and one that I have not seen yet. 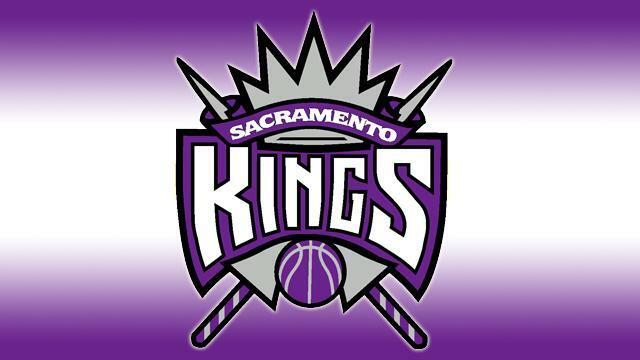 The NBA draft is on today at 9.30am Melbourne time, tune in and see who the Sacramento Kings choose. #TBT and why established brands should be using them! 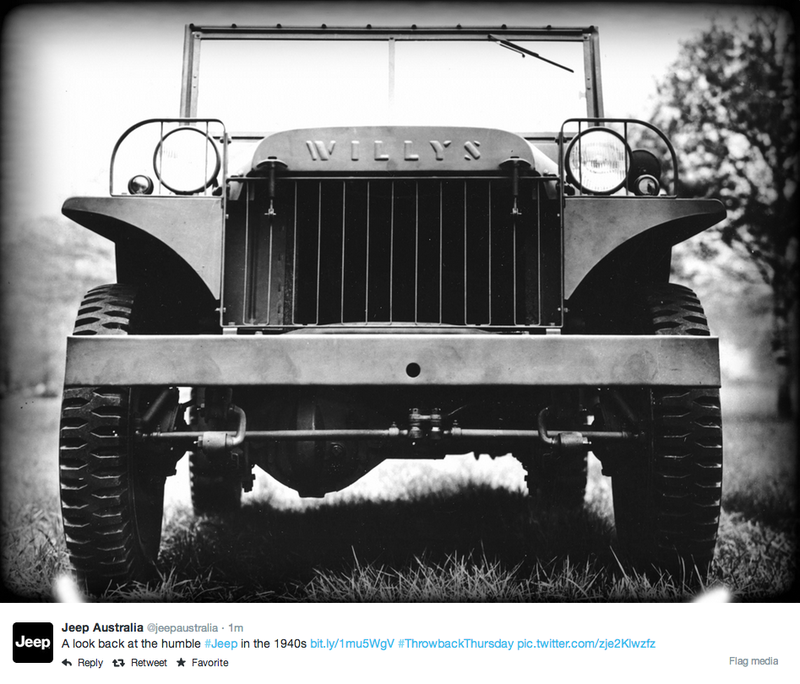 Great example of a #TBT tweet from Jeep Australia. A while ago I wrote a post suggesting brands should be incorporating Facebook Milestones into their content strategy. I stand by this and think all brands if the content is there should be executing this. Along with Facebook, brands should be considering jumping on the ever popular #TBT or #ThrowBackThursday hashtag, as digital communities enjoy seeing these updates on Twitter and Instagram from their fave brands. Be sure to have some fun with the tone and engage your community with a question. 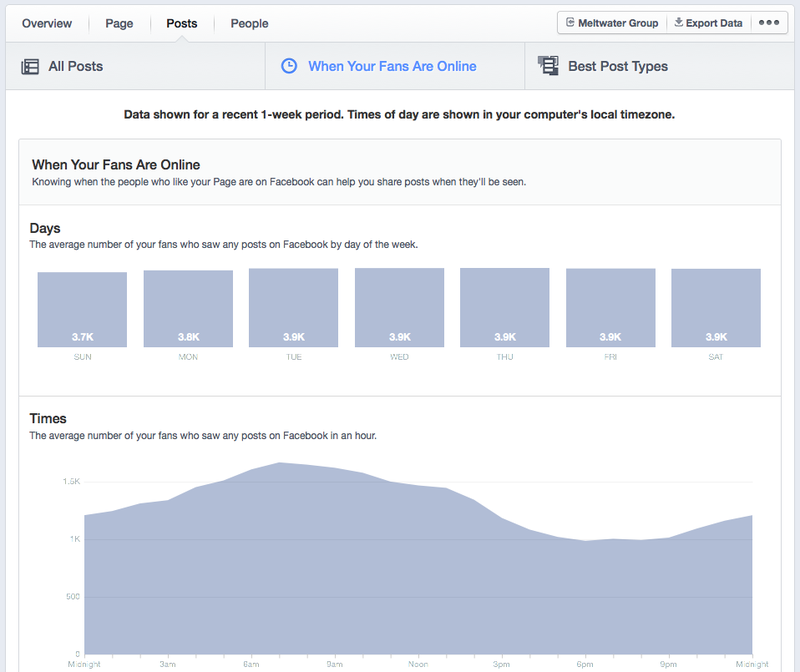 Facebook have recently tweaked their Facebook algorithm which decides what content is seen in users NewsFeeds. Facebook are very eager to understand which users watch videos and which skip past them, understanding this will allow Facebook to target video ads to those users who are more likely to watch them. This of course will be pushed by Facebook as it’s a new revenue stream that they’ll want to prove works. Video ads are set to be released in Australia this month, if you’re keen to invest more money into Facebook this might be an option to consider. As I’ve stated previously I personally think brand budget would be better spent elsewhere. Video ads need to first be created (cost in that) and then you need to pay Facebook for plays (another cost), this just seems a little expensive. However I’ll keep the door open on this one until I see some actual results. Anyone keen to try Facebook Video Ads? 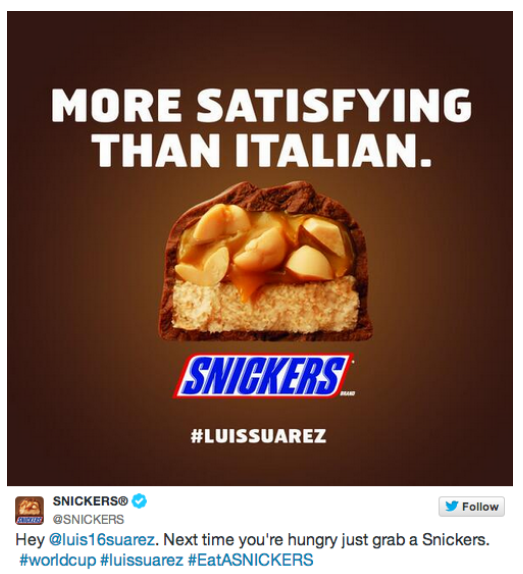 Snickers latest tweet is brilliant. Timely, relevant and awesome. This is how Twitter should be played, see an opportunity and execute flawlessly. Facebook Insights has a whole lot of data which is great if you know what you’re looking for, but with so many stats marketing managers can find it hard to wade through the stats and find the gold. Below are key stats that all marketing managers should be watching out for, if they want their Facebook page to have any success. Click on ‘POSTS’ and you’ll then be able to see which days your community is on Facebook the most and also at what times the majority of them are online. Understanding this you’ll be able to post your content at more appropriate times to you community. This page will also give you an insight into which posts are generating stories, reach and engagement. Depending on your Facebook objectives what’s important will be different. How many eyeballs have seen this post. I’ve found the albums are generating the most reach in posts and highly suggest where possible involving albums into your content strategy. Users don’t have to like or comment on your posts. If they click on the image, click through your album or even click on a link in your post copy. This all contributes to this stat. Understand that when users do this, it’s not creating a story on their friends NewsFeed. You’ll find this number is generally higher than the below when your brand is on sale as the call to action (CTA) is to leave Facebook and check out your offer. This is when a user engages with your post and creates a story so it’s then seen in their friends NewsFeed. Have strong CTA’s in your post copy (example: which one do you prefer? ), will help to increase your talking about us stat, which has direct correlation with reach. The real gold you’ll find when you ‘EXPORT’ your stats. Export your stats based on a date range search and open up the spreadsheet. 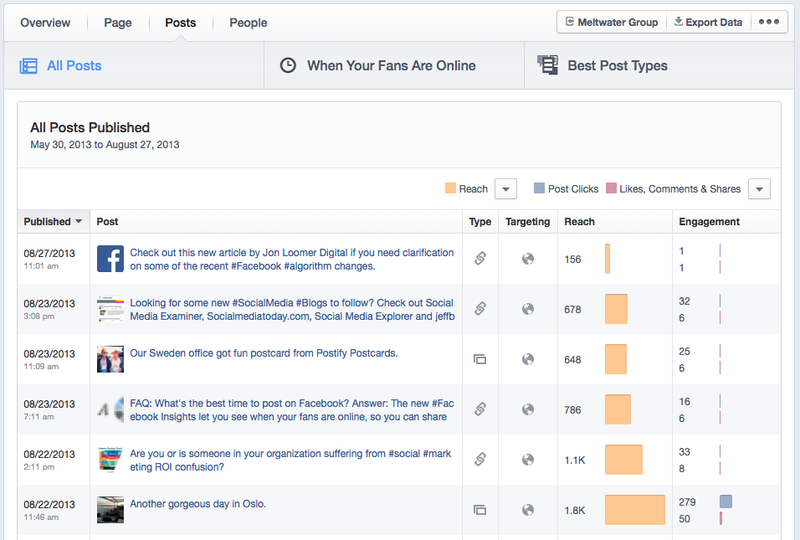 This column will tell you how many of your community are creating stories out of your posts. You want these daily numbers to be as high as possible. This column should tell you what days are working and which are not. You as marketing managers should be tweaking your content strategy based on these findings. The more users creating stories from your content, the further your organic reach will be. This column explain how many daily users are engaging with your brand. It would be wise to put both columns next to each other, which will give you a true indication of which post style/content is resonating best with your community. You need to understand which content is working and which is not. From these learnings you should be adapting your content to what your community desires. Facebook is a two way communication channel so, listen, respond, acknowledge and the most important ADAPT!. How to your Find Key Influencers on Twitter. Klout is a score which determines how influential that user is online. This score is out of 100, the higher your Klout score the more influence you have over your followers. Those with high influence will be able to turn tweets into action. HootSuite allows you to run many filters and streams on keywords. You first need to filter that down to a geo location relevant to your brand. Once this is done, you may find your created stream is full of pointless conversations that is taking you sometime to scroll through. Whilst listening to everyone is important I also suggest you set up a second stream for Klout users, that way you can keep in touch with what your key influencers are saying and doing. This video is already been created by our good friends at HootSuite, so watch below, it’s super easy.